Leading up the hill towards the Macclesfield Canal, Hawthorn Road, a cul de sac, contains a mixture of premises. On the right at the bottom is an unused workshop, followed by the Christian Life church. 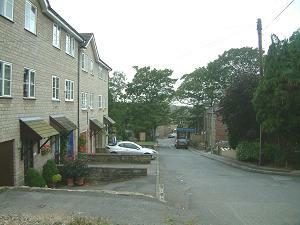 Then comes Hawthorn Mews (left in picture) followed by a c.2000 development of seven houses. On the left are cottages and a modern bungalow. Opposite the Mews is Waterhouse Avenue. 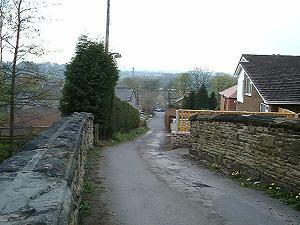 The top 150m is a private road with two detached houses and, across the Middlewood Way, there is a row of early 20th century stone houses known as Alderley View – and indeed they certainly have a good view. There is pedestrian access to the Macclesfield Canal at the top of the road. Leads to Waterhouse Avenue, Alderley View. Previously known as Glue Sheds Road. At Glue Sheds Farm they used to boil down animal bones to make glue. This process produces the most appalling smell so they can’t have had many friends! Around 1903 Mr A. Howe was a Joiner & Builder with premises in Glue Sheds Road. Macclesfield Canal milestone ; II, located a few metres north from the canal access, c.1830.